In these blogs we make a point of looking at areas that often cause difficulties for learners of English. This week we are considering how we talk about obligation – the fact that we must do something, either because of a rule or some other need. 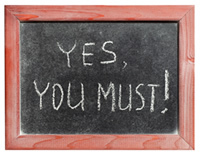 We will start with the differences between ‘have to/need to’ and ‘must’, and when we use one and not the other. You have to/need to be there for eight o’clock. I have to/need to get some money out. You have to/need to get a form from the office. I must call my mum tonight! I must remember to pay Emily for the ticket! It’s a brilliant movie – you must see it, Tom. Ooh, you must try this chicken – it’s delicious! You look so tired, Lucy. You must get some rest! All participants must be 21 or older. Applicants must have a strong command of the English language. Meat must be cooked thoroughly. I had to catch the train so I left early. You will need to tell Jim. ‘Must not’ or ‘do not have/need to’? We must not forget our past. We really mustn’t miss that train! You mustn’t tell Alice – she would be so upset. There will be food at the party so we don’t have/need to bring any. You can come if you like, but you don’t have/need to. Do I have to?/Must I? Does Maria need to buy a ticket in advance? (formal) Must we all attend? I’ve got to (= I have got to) finish this essay this afternoon. Note that ‘have got to’ can only be used in the present tense. Tanks you for the post, it has been a useful reminder of the necessety for checking-up on every leaner’s clarity in this area of the grammar. The sentence, Applicants must have a strong command of the English language, doesn’t sound quite right to me. We might say, for example, “Islam is the command of Allah”, or perhaps that the law is the command of the sovereign. But is the logical relationship between “applicants” and “the English language” the same as that between “law” and “the sovereign”? Hi Luc – actually, although ‘have got to’ looks like the present perfect tense, it is only ever used to refer to the present. Is there a nuance between I don’t need to bring food and I needn’t bring food? it has been very helpful .Thanks.I start today following your blog. Why that ‘have got to’ used in the present tense? Why say Sept 3 and not 3 Sept? Could you also say something about expressing obligation with ‘should’? It has been very helpful for me. I have clarified some doubts that I had. Thanks a lot for the information! Great post as usual but I am just wondering about MUST in sentences like this ones; ” You must have been a beautiful baby” or ” You must have got me wrong” or Roxette song ” It must have been love” as you said MUST we could use only in the present tense but this sounds like the past. I gave the link to this page to someone who is having a really tough time understanding the difference between ‘have to’ and ‘must’. Hopefully she takes notes and reviews them. Thank you for such a simple explanation. Thanks for your description about ‘have to’ and ‘must’. I´m starting to learn English and it was of very help.